When 12-year-old Linc Crenshaw decides he wants to go to public school, his professor mom isn't so happy with the idea. He's convinced it will be the ticket to a new social life. Instead, it's a disaster when his mom shows up at their field trip to the local cemetery to lecture them on gravestones, and Linc sees her through his fellow-students' eyes. He's convinced his chances at a social life are over until a cemetery-related project makes him sought-after by fellow students he's not so sure he wants as friends, helps him make a new, genuine friend, and brings to light some information about his family that upends his world. Delia Ray has written a funny, heartfelt story about a lonely kid and his mother as they ultimately cope with the grief left behind from his dad's death, and along the journey find new ways to connect with each other, and their community. When DELIA RAY was little, she and her sister and their cousin invented the Brave Girl Club as a way to make the long, hot summers in Tidewater, Virginia, a little more exciting. They dared each other to perform all sorts of daunting challenges—swims across an algae-covered, snake-infested pond, for example, or solo trips to the second story of an old, abandoned farmhouse hidden deep in the woods. Delia says she still uses her Brave Girl training today whenever she's conducting research for her books, which have taken her on adventures from the Yukon Territory in Canada to cemeteries spread across the state of Iowa. Between adventures, Delia lives in a house overlooking the Iowa River with her husband, three daughters, and a strange-looking mutt named Griff, who came from the animal shelter and provided the inspiration for C.B. in this book. 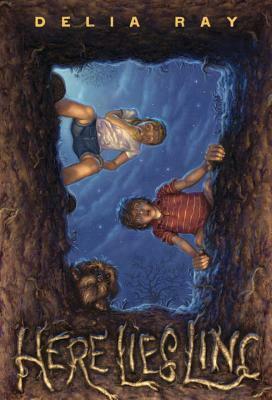 Here Lies Linc is Delia's third novel for young readers.